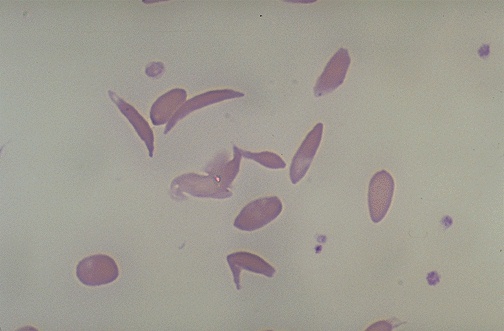 � Here is another example of sickled erythrocytes in a patient with Hgb SS who presented with severe chest, abdominal, and back pain along with hemoglobinuria in sickle crisis. The sickled cells are prone to stick together and to endothelium of microvasculature, plugging smaller vessels and leading to decreased blood flow with ischemia. The sickled erythrocytes undergo hemolysis, depleting serum haptoglobin and overwhelming bilirubin clearance mechanisms.